This is a guest blog written by our Senior Conservator Susi Pancaldo. The Petrie Museum of Egyptian Archaeology houses one of the largest and most important collections of Egyptian materials in the UK. About 12,000 of the 80,000 objects are made of ceramic and, of these, roughly 3,400 are on display in the Pottery Gallery! Pottery inspection at the Petrie Museum. This year PACE conservators are focusing attention on the conservation needs of these important teaching and research materials. A pilot Conservation Needs Survey is underway. So far, problems primarily consist of weakened ceramic structures due to soluble salt contamination and failing, previous conservation interventions. 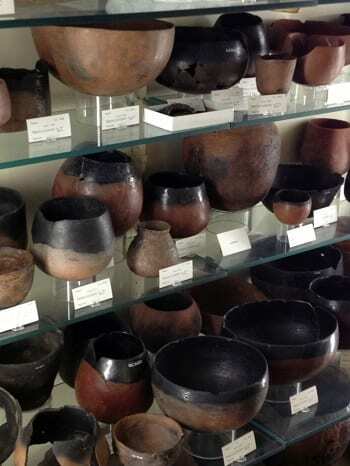 Most of Petrie’s pots have been out of the ground for over a hundred years and have gone through several campaigns of treatment. As part of this Conservation Survey, we are collating historical information about past treatments. This information will be invaluable in planning future conservation work at the Petrie Museum as well as for Petrie-excavated materials in collections across the globe. 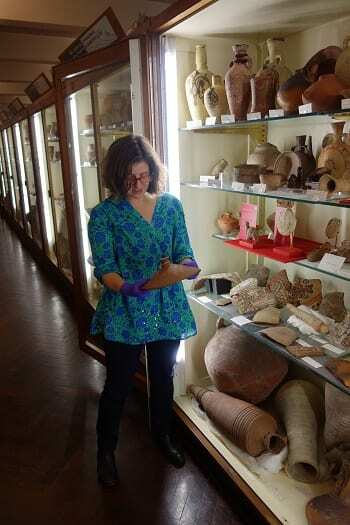 The current project is being piloted as a collaboration between the UCL Museums and Collections conservator Susi Pancaldo, and Institute of Archaeology lecturer Dr Caitlin O’Grady. It is hoped that the survey will be expanded and adapted as a teaching and learning project for conservation and archaeological science students in years to come. Susi Pancaldo is the Senior Conservator for UCL Museums and Collections.